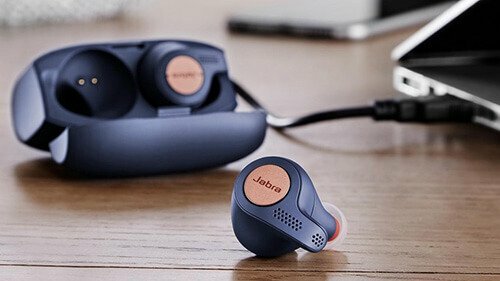 At the beginning of 2018, Jabra introduced two new models of wireless headphones — Jabra Elite 65t and Elite Active 65t, which should meet all the needs of the majority. 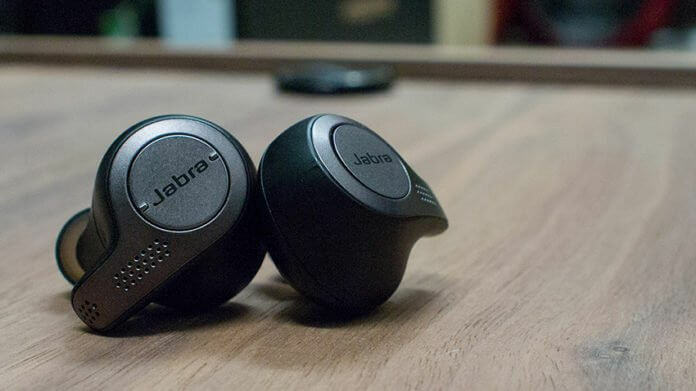 Jabra Elite 65t is marketed as”designed for true music lovers of wireless headsets.” That’s a bold statement, that’s why we wrote this jabra elite 65t review. The first thing that catches your eye in Elite 65t is the evolution in design. Compared to last year’s Elite Sport, the 65t version looks more refined and compact when in the ear. 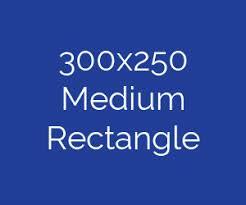 The combination of plastic with artificial metal gives the gadget an excellent appearance. These new headphones are designed in a more compact size, with a convenient location of microphones. Included silicone tips provide a snug fit to the ear and high-quality sound transmission. Jabra Elite 65t is not a sports model, however, it has an IP55 rating, which offers water resistance. Despite the fact that Elite 65t are designed for everyday listening to music, not for the gym, during training I did not feel discomfort. However, with excessive sweating during exercise, landing in the ear became more free. There is also a case-charging, it is a small black box with A micro USB port on the bottom panel and one led that lights up during connection to the network. The Jabra Elite 65t features are accessed via the Jabra Sound + app, which I installed on my LG V30. The devices were paired automatically as soon as I removed the headphones from the case. The Jabra app provides battery information in percentage format. The interface features four main functions, including voice assistant, sound setting, call log and equalizer. You can also choose which voice assistant we want to use: Google Assistant or Amazon Alexa. The Hear Through function allows you to capture the sound environment with a pair of microphones on each earpiece, and then output it through the speakers. 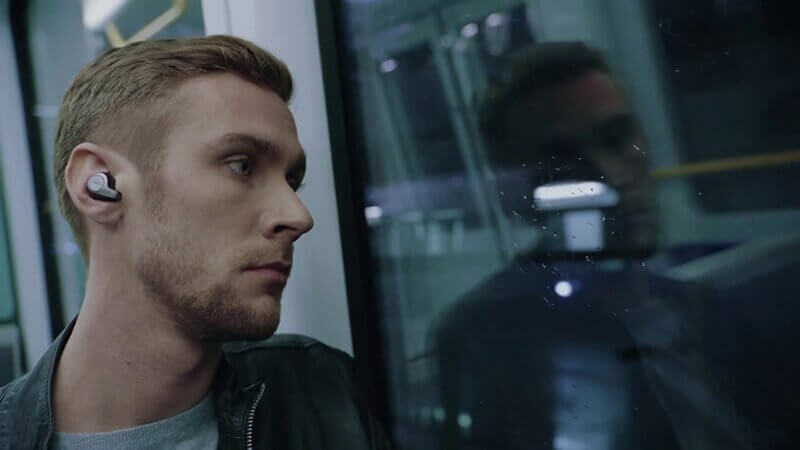 Thus, the user will not be isolated from the environment, it is quite comfortable to communicate with the interlocutor without removing the headset from the ear. Additional features in the Elite 65t include automatic pause when removing headphones, the ability to amplify voice during a phone call, Sidetone calls, And a caller ID sound. Music equalizer allows you to adjust the sound quality for a specific person. Since Amazon announced its ‘On the Go’ integration earlier this year, there have been a smattering of vendors supporting it. Through the Sound+ app’s voice section under settings, there’s an option to disable Siri or Google Assistant and go with Alexa instead. All I needed to do to get it done was sign in with my account. Despite there being two microphones on each side, it wouldn’t respond to the standard “Alexa” prompt. It needed me to hold the button on the right side to activate. From there, I could ask it for basic things, but was limited in key respects. For example, the only music I could request came from Amazon Music. Spotify wouldn’t work at all, which was annoying, considering the functionality works so well on Alexa-enabled speakers. I also couldn’t make phone calls, taking away a feature I otherwise take for granted when using Siri or Google Assistant. For those reasons, I opted to go back to those voice assistants and silence Alexa. 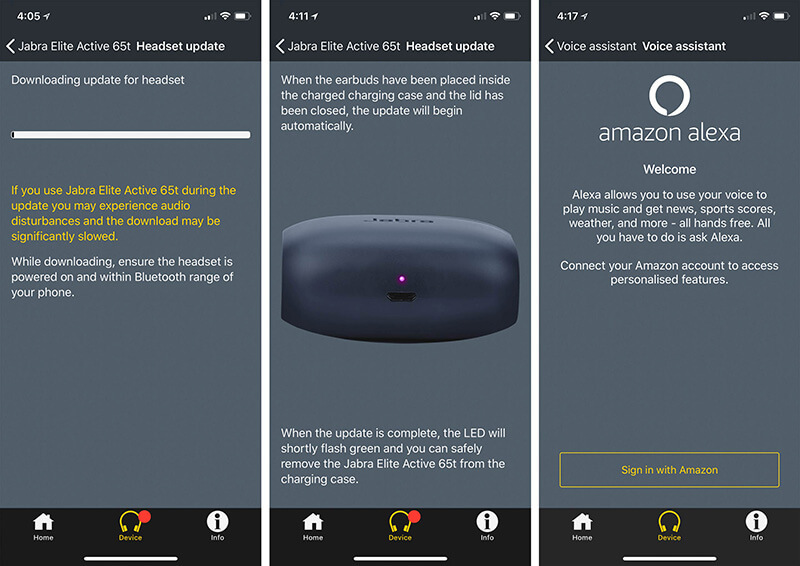 Bluetooth 5.0 connectivity in the range of up to 8 meters was stable, despite the fact that Jabra Elite 65t headphones and my LG V30 shared two rooms. Even some of the best and most expensive wireless headphones have not such a stable connection in close proximity to the smartphone. There is no need to worry about the line of sight of the devices or about the phone being located on the same side as the main earphone. The Elite 65t also has no delay issues when watching videos. Everything synchronizes quickly and without problems. The Elite 65t is equipped with three physical buttons on the sides, which, unlike the touch ones, prevent accidental presses. The two buttons on the left earpiece control the volume and song switching, and the only button on the right serves to play/pause music, make calls, activate the voice assistant, as well as to turn on/off the HearThrough technology. The sound quality of the Jabra Elite 65t is impressive. With custom equalizer settings, you can fine tune the playback to your liking. However, even without using the equalizer, the headphones provide a clear, well-balanced sound. Even at the highest volume, there is no distortion. The only problem is that Jabra’s Elite 65t can’t handle noise suppression. A tight fit should eliminate the audibility of the surrounding sounds. But, in the gym I can clearly hear what is happening around me. It’s a little disappointing. Last year’s Jabra wireless headsets had weak batteries, and it looks like Jabra took it seriously — the battery life of the Elite 65t is impressive. Playing the same song on the repeat function at maximum volume, lasted 6 hours, until the full discharge is more than 5 hours, for which they are designed. The charging case is designed for an additional 10 hours of headphone operation (two additional charging cycles). Jabra Elite 65t is priced at ~ $170, the best alternative to AirPod. The Elite 65t is no better than the Bose or Bang & Olufsen wireless headphones, but, for the price and quality, it is the best option. With custom equalizer settings, solid sound, great battery life and intuitive features, Jabra’s Elite 65t is easily among the top five wireless headsets on the market. Should you buy them? Yes. These headphones offer excellent performance at an affordable price, they are worth considering first.